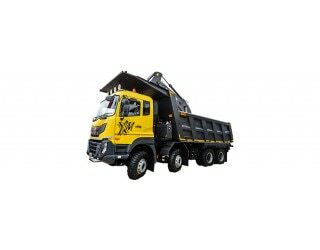 Dec 30, 2018: The Eicher Pro 8031XM is a good middleweight tipper that features a Rock/Scoop body. It comes with a tiltable sleeper cabin where a hydraulic power steering, standard AC, telematics and driver information display are available. The truck comes with air brakes that offer good stopping power. The brakes are further aided by the presence of ABS that improves the braking efficiency. The vehicle comes with a Parabolic suspension with stabilizer bar up front and a shock absorber with maintenance-free bogie suspension with inverted U-bolt at the rear are responsible for managing the suspension duties. The vehicle is powered by a 7.7-litre, BS-IV compliant engine that pumps out up to 330 bhp of power and the peak torque sticks at a massive 1,200 Nm. The drive is sent to the wheels via a 9-speed manual transmission. © Copyright 2008-2019 Powered By Girnar Software Pvt. Ltd. All Rights Reserved. Check your inbox. You have received a verification e-mail!